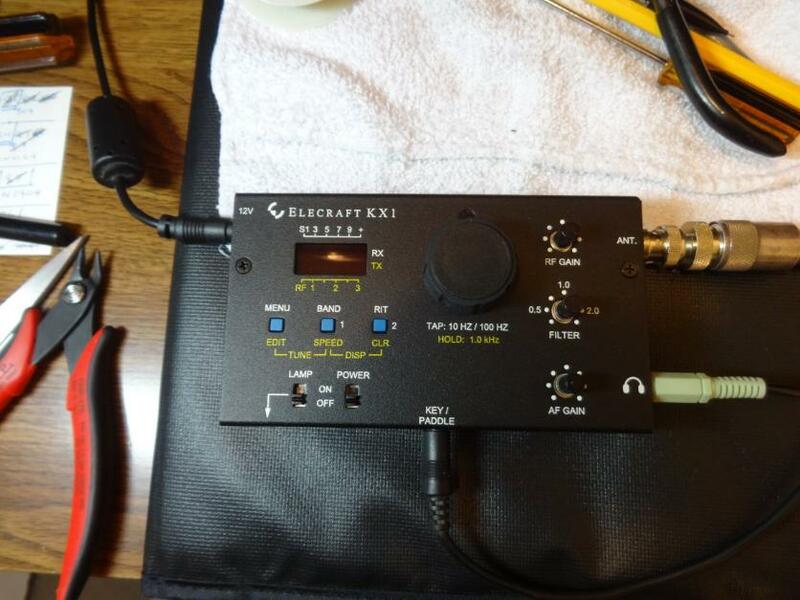 The Elecraft KX1 is an excellent CW transceiver, even in the hamshack, for those that have a critical ear. It has the quietest receiver and best note of any CW rig I know of, outside of the Ten Tec Corsair II / DDS that I also use. I have mine connected to the station supply, station antenna (hexbeam), amplified speakers, and Bencher paddles. I have "boots" when I need them at the press of a switch. The radio is an absolute bargain at $299, but you would never know it looking at the small enclosure. Elecraft made it small and amazingly simple to operate, but still managed to pack all of the most important features anyone could want at home or in the field into one compact device. 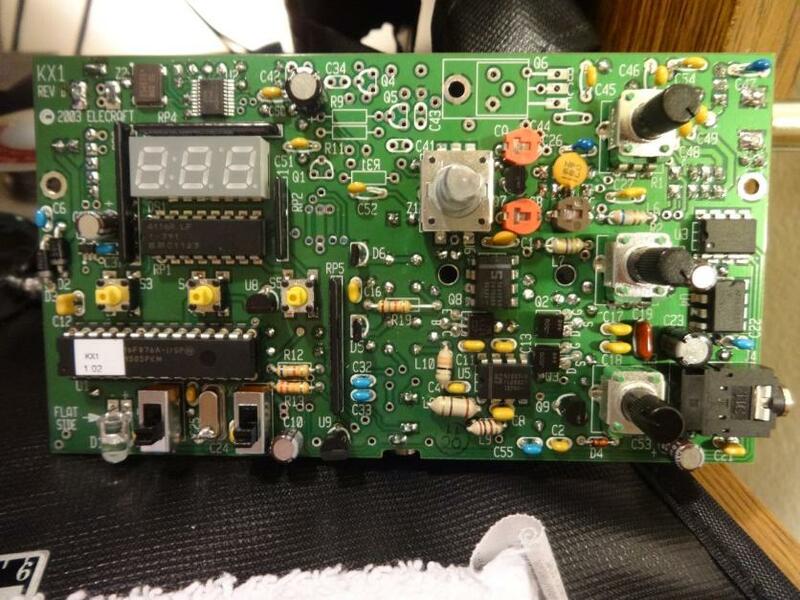 Number one, all of the features are there, CW keyer, memories, tunable crystal filter, RF Gain, S-Meter, and DDS. Number two, and more importantly, even though you can find some of these features in other offerings, Elecraft makes it a no brainer for the user, all of the features are thoughtfully implemented and 100% reliable. There will likely be some head scratching and dialing-in with other vendor's similar offerings. 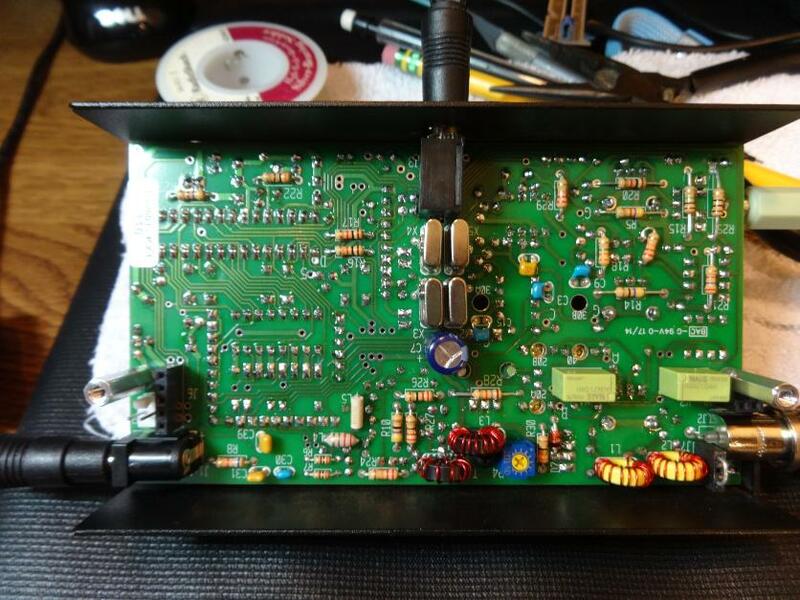 I cannot overstate Elecraft's attention to detail, quality control, or top notch engineering. This is one of Elecraft's initial offerings and is over a decade old now, yet still lapping the field when comparing to the newest NE602 designs. Confidence builder (above), stage one power supply and microprocessor install followed by a power on test. The tiny SMD components at the upper left come pre-installed. Built up PCB. 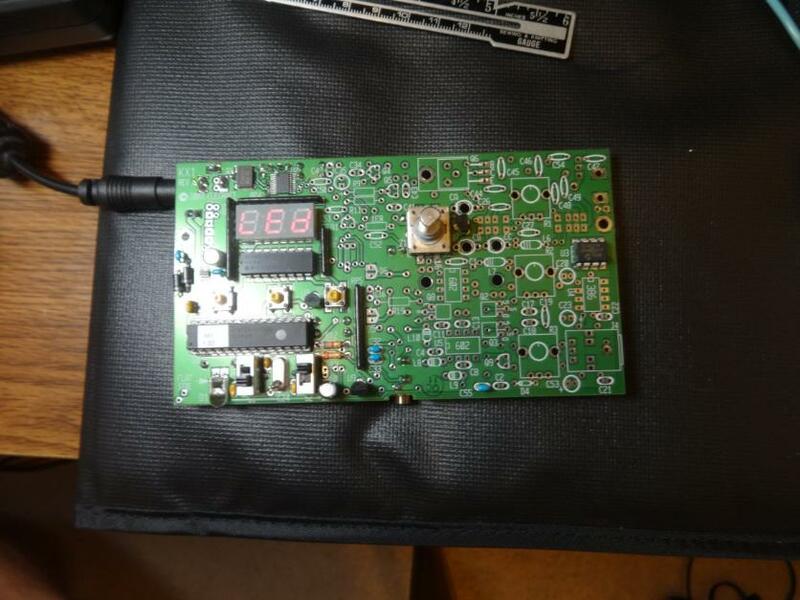 All went smooth enough, but some years after the kit was designed the workhorse NE602's (there are two) were put on a list of components that are no longer "GREEN" enough to throw away and so Elecraft decided to replace them with a tiny modern SMT device mounted on a daughtercard that the user is then to wire into the existing position. I found 5 of the original part on Amazon for $5 (total delivered) and happily used them. Here is the back side of the completed KX1. A couple construction notes, mounting those crystals while the PCB is upside down can be a bugger, I just inserted them all at the same time, then used one long scotch tape across the electrolytic capacitor, then across all of the tops and then onto the JACK for keyer paddles. They all stay nice and tight in there until you can solder them. Also remember to ground each crystal at the base, not to the top of the can as the habit may be from other projects. Also, the screw for mounting the final transistor is just a bit short, be sure only to remove one washer and remove the right one! Finally, the supplied tape came nowhere close to securing the RED WINDOW to the KX1 case, I used double sided foam tape (GORILLA quality) to secure this.